Today, the major concerns of the chemical and pharmaceutical industries are improving performance and reducing production costs. Agitation, mixing and heat transfer are all directly linked to this problem. which offers optimal resistance to highly corrosive processes, impact and abrasion, and facilitates cleaning. One-piece construction agitators have a restricted field of application because they need a large opening to be installed, and encounter additional issues including sealing problems, difficulty cleaning, and mandatory dismantling of the drive for any maintenance. Still, there are certain applications in which this design is sufficient. Not sure what agitator is right for your application? See our agitator comparison chart or let DDPS customize your agitation system with an agitation simulation to ensure optimization of your reaction process. GlasLock blades are lined with 3009 glass for superior corrosion resistance. They are available in a variety of blade designs to meet various process requirements. 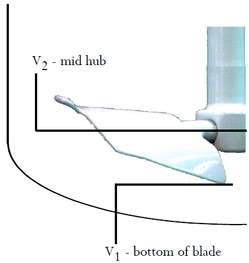 The pitch angle of these blades gives a smoother contact with the product than the vertical trapezoidal blades, and is specifically recommended to avoid the alteration of fragile crystals. OptiFoil is ideally suited for reactors involving homogenization and suspension, as well as heat transfer, crystallization, and dispersion. 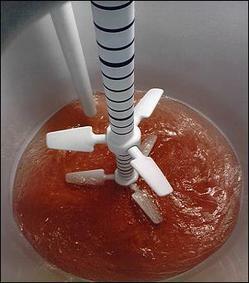 Its axial/radial flow is advisable for virtually every process. OptiFoil will also mix higher viscosity liquids than standard flat blades. Built specifically for use in glass-lined steel vessels, OptiFoil blades are available in one-piece or GlasLock construction and can be made in a variety of sizes to match your vessel size and process. The blades can also be retrofitted into existing GlasLock agitator shafts, updating current equipment to state-of-the-art technology. Today, the major concerns of the chemical and pharmaceutical industries are improving performance and reducing production costs. Agitation, mixing and heat transfer are major factors in maximizing the efficiency of a process. 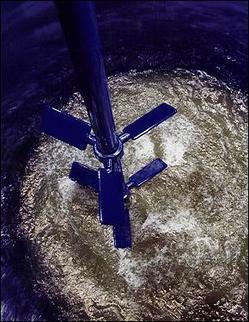 The various blade designs in our agitator product range have undergone significant research and testing, making it possible to use a scientific approach to agitation and heat exchange techniques that will optimize your process. 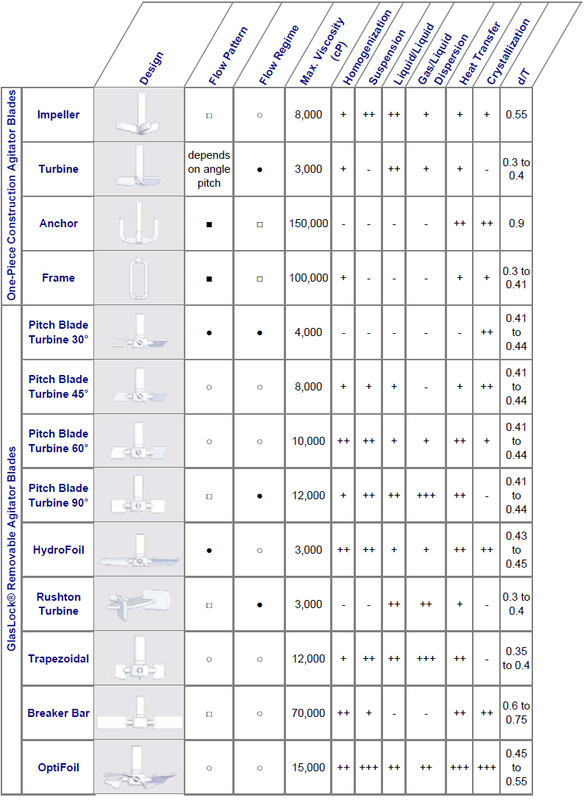 The chart below illustrates the different types of blades available and the characteristics of each.